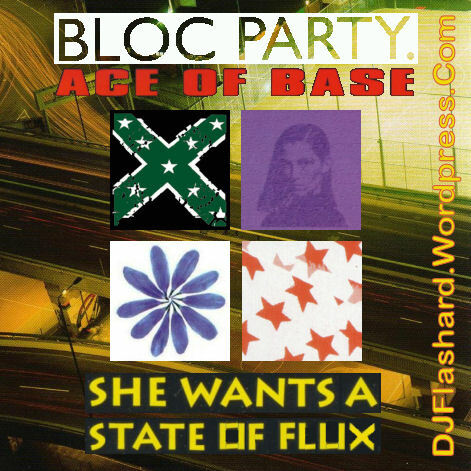 Bloc Party vs Ace Of Base – She Wants A State Of Flux. Sorry there’s been no updates for a few weeks (blimey, it’s been nearly a month! – must do better! ), but been away on holiday and work is a little busy at the mo, so don’t get much chance to skive off! ;o) Anyway, finally got round to finishing and publishing my new mash. Hope you like it. It features Bloc Party – Flux (pella) and Ace of Base – All That She Wants (mental and DIY pella). Didn’t need to alter the Ace of Base mental too much – just a few cuts here and there. It was the Bloc Party pella that needed more work – on the chorus, the vocals have rather heavy reverb and makes it sound very metallic. Tried to cut some of the echo so that the vocals fit the mental better. Also, used some cuts from DJ Schmolli’s DIY pella of Ace of Base to try and tie the two tracks together a little better. Hope you like the results – comments and feedback welcome, as always! DJ Flashard – Bloc Party vs Ace Of Base – She Wants A State Of Flux. Mixed using Bloc Party – Flux (Acapella) and Ace of Base – All That She Wants (Instrumental and DJ Schmolli DIY pella).